They say the early bird gets the worm. In this case, it apparently gets three of them. Robins are these charming birds that to many of us means that warm weather is on the way. Their song is sweet and their coloring similar to bluebirds. Robins, of course, are larger and where the bluebird is blue, they are brown. Both birds are favorites in the United States. The Planesticus migratorius is a migratory bird that breeds in the continental United States, Alaska, Canada and Mexico. It winters in the United States and can be found as far south as Guatemala. Robins do indeed like worms and a variety of insects, but they predominantly eat vegetable matter, specifically fruit. They prefer wild fruit over cultivated and some farmers, particularly olive growers will plant wild berries to protect their crop from insects. 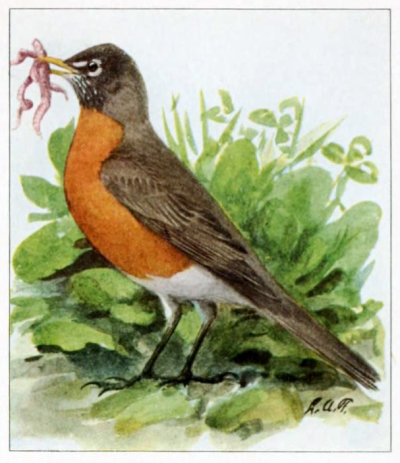 This robin bird image is from a book from 1918. It includes bird illustrations from one of my favorite artists. This drawing has a pretty robin standing among some clover and other low-growing greenery. In his beak are three wiggling worms. The printable size of the image measures 4 inches by 4.6 inches. A great size for mixed media, scrapbook and even web pages. Like all of Fuertes work, this bird image is in the public domain and ready to be used in your own projects. It was included in the 1918 work The Book of Birds, Common Birds of Town and Country by Henshaw.